Endeavour Blasts Into Space : The Two-Way With wounded U.S. Rep. Gabrielle Giffords (D-AZ) on hand to watch as her husband and the other five astronauts launched, the shuttle is on what's scheduled to be its last mission. The space shuttle Endeavour lifts off from Kennedy Space Center in Cape Canaveral, Fla., Monday, May 16, 2011. Update at 8:56 a.m. ET: Lift Off! Space shuttle Endeavour and its crew of six astronauts is on schedule to blast off from the Kennedy Space Center in Florida at 8:56 a.m. ET. A Gopher turtle crossed nearby on Sunday as Endeavour sat ready on the launchpad. As NPR.org writes, "with wounded U.S. Rep. Gabrielle Giffords (D-AZ) on hand to watch ... Endeavour is poised to give the work week a roaring and historic start Monday morning, overcoming wiring problems that grounded it last month." It is set to be the shuttle's final mission. Giffords, who was critically wounded on Jan. 8 when a gunman attacked an event she was holding in Tucson, Ariz., (six people died and another 13, including Giffords, were wounded), is married to Endeavour commander Mark Kelly. She has been recovering at a rehabilitation hospital in Houston. -- Via NASA's Twitter feed. -- Via #NASATweetup on Twitter. Update at 9:20 a.m. ET. "Picture-Perfect Liftoff". "The space shuttle Endeavour made a picture-perfect liftoff Monday morning as it headed for the International Space Station in the penultimate flight of the shuttle era. "Endeavour roared off the launch pad at 8:56 a.m. ET carrying a six-member crew and a multibillion-dollar particle physics experiment. 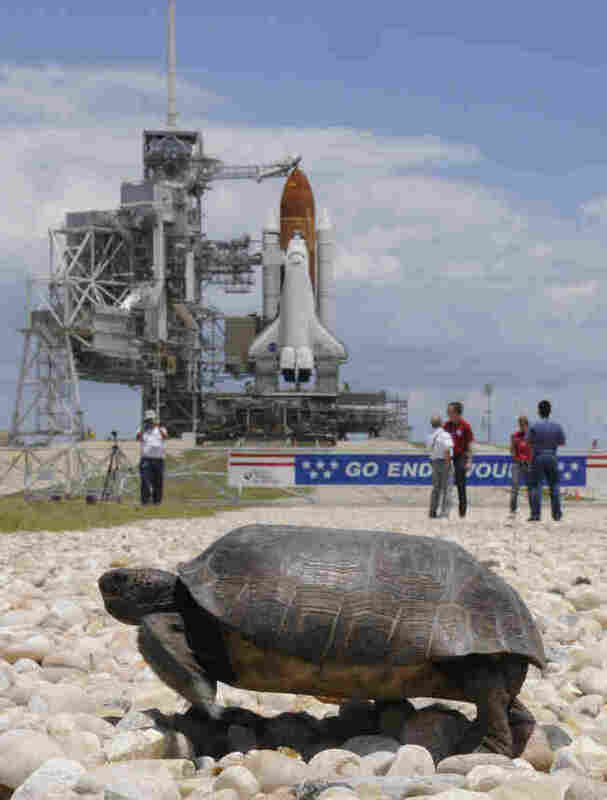 One final shuttle mission remains, by Atlantis in July. "As many as half a million people were expected to gather in the area around the Kennedy Space Center in Florida to watch as Endeavor streaked into space one last time before heading to retirement at a Los Angeles museum. "Among them was mission commander Mark Kelly's wife, Arizona Rep. Gabrielle Giffords — recovering after being gravely wounded in a shooting rampage in Tucson earlier this year." With that, we conclude our live-blogging of the launch. Scroll down to see how the story developed. And thanks for reading long. Update at 9:12 a.m. ET. "Team Giffords" Wishes Crew "God Speed". "From Team Giffords to @ShuttleCDRKelly & entire #STS134 crew: God Speed--We'll see you in about two weeks. #NASATweetup." 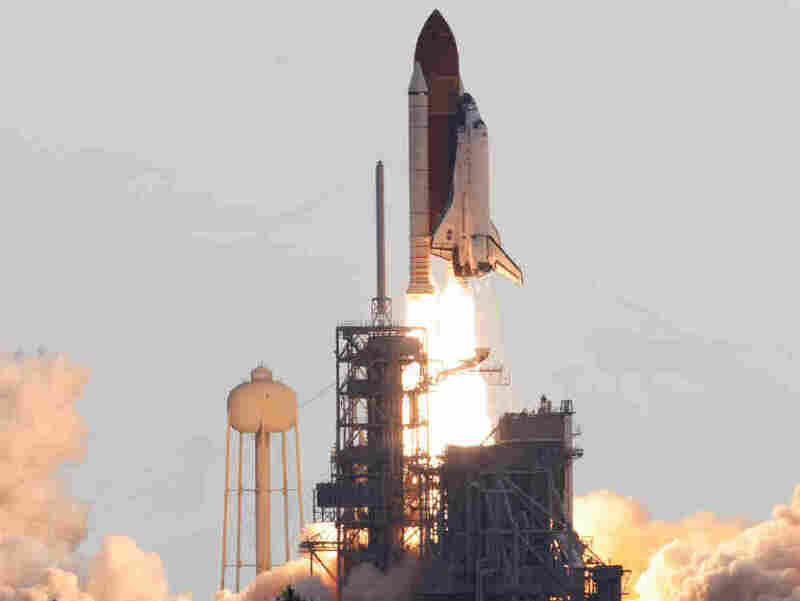 NASA says the shuttle is now "safely into space" on its 16-day mission. The mission continues with no problems. NASA says that "Endeavour launched on time at 8:56a ET. Main Engine Cutoff at 9:04a." About 4 minutes into the flight, NASA reports all systems aboard appear to be in good shape. Update at 8:58 a.m. ET. Successful Separation of the Twin Solid-Rocket Boosters. Update at 8:56 a.m. ET. "Lift Off." Update at 8:55 a.m. ET. "T-minus 1 minute." Update at 8:54 a.m. ET. "T-minus 2 Minutes." Update at 8:53 a.m. ET. "T-minus 3 Minutes, 30 Seconds." Update at 8:51 a.m. ET. "T-minus 5 Minutes." Update at 8:50 a.m. ET. "T-minus 6 Minutes." The planned "hold" is over and the countdown clock has started again. "T-minus 9 minutes and counting." Launch control just told Kelly that the launch is a go and wished him and the crew "good luck, Godspeed." NASA just went through its pre-launch status checks and reported that the launch team is "ready to proceed." The word from the Space Center is that its a good day for a launch. Indeed, Weather.com says it's about 64 degrees with a 6-mph wind from the west northwest. Update at 8:35 a.m. ET: About 20 minutes to go and the launch is still a "go," they just said on NASA TV. Update at 8:15 a.m. ET: The launch is about 10 minutes into a planned 40-minute "hold" during which "a series of polls will be conducted to verify launch readiness," NASA says.